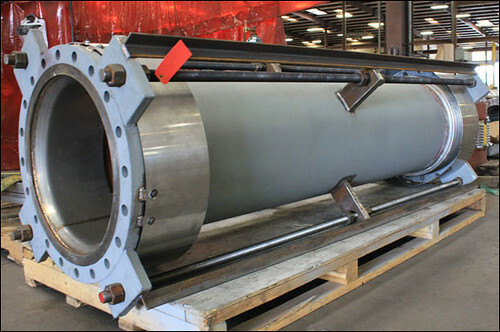 U.S. Bellows, Inc. fabricated this 28″ dia., 109″ long universal expansion joint with 1″ thick AA-22 abrasion resistant refractory lining and pantographic linkage for a FCC unit in an oil refinery. The entire assembly is fabricated from 304H stainless steel with carbon steel pantographs. This expansion joint has two-ply testable bellows with wire mesh strip between the plies. It is designed for an axial movement of 5″, a lateral movement of 5-1/2″ at 1425°F and 45 psig. This unit was 100% dye penetrant tested, all pressure retaining welds were 100% radiographed and the unit was pneumatic tested prior to shipping to Oklahoma. 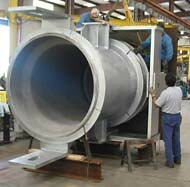 U.S. Bellows designed and fabricated several single and universal expansion joints for a 12″ pipe size. The single joint has an axial movement of 1 3/8″ and the universal joint has a 2 1/2″ lateral movement. The design pressure is 276 PSIG and the design temperature is 626°F. 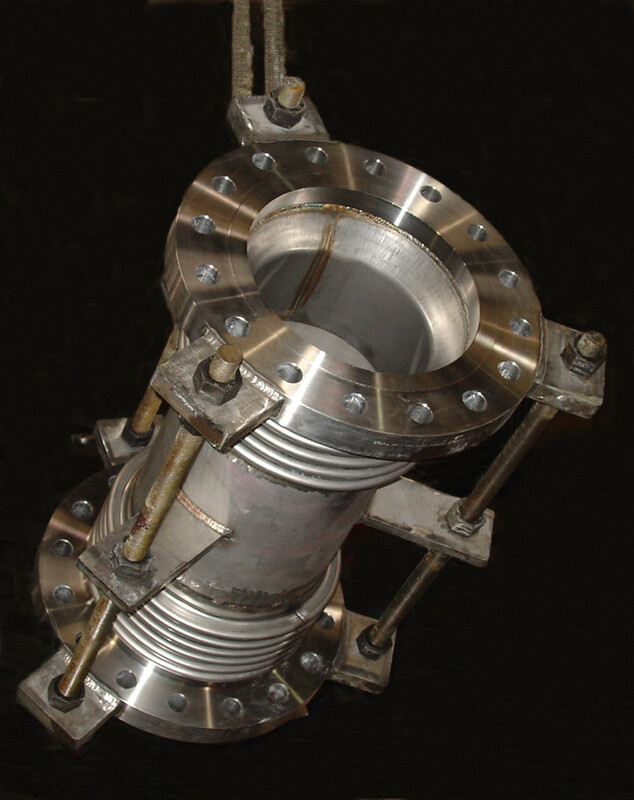 Both single and universal expansion joints have 316L SS bellows, flanges and tie rods. 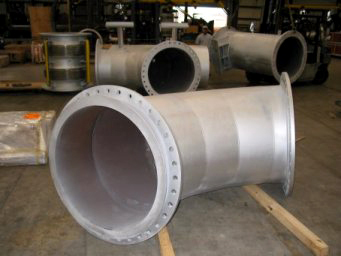 These expansion joints have 300 pound raised face stainless steel flanges and are designed to accommodate the customers’ low spring rate requirements. Each expansion joint was 100% dye-penetrant tested and hydro-tested at 414 PSIG. U.S. Bellows completed this expansion joint project ahead of schedule. 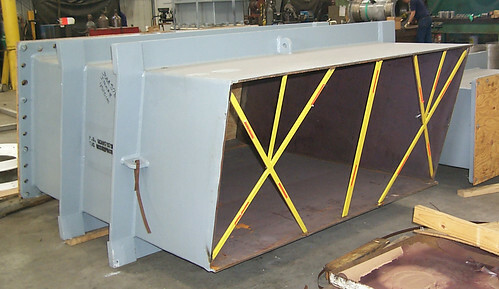 U.S. Bellows, Inc. specially designed and manufactured two 55″ O.D. 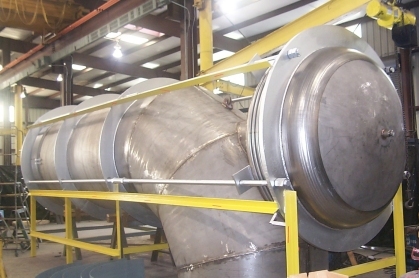 refractory lined universal gimbal expansion joints for a refinery in Joliet. 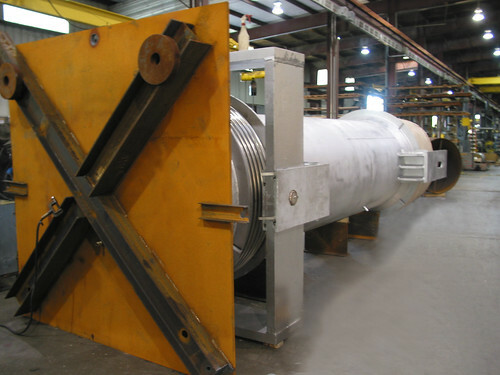 These expansion joints are equipped with slotted hinges with an overall length of 163″ and 286″ respectively. The 163″ O.A.L. 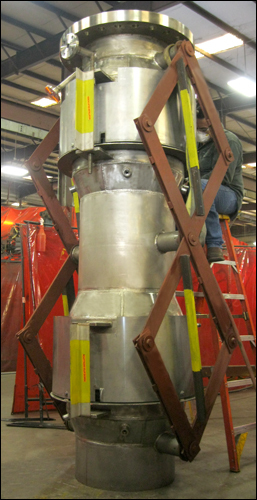 expansion joint, designed for 60 PSIG and 1020°F, will be used at the reactor stand pipe of the refinery. The 286″ O.A.L. 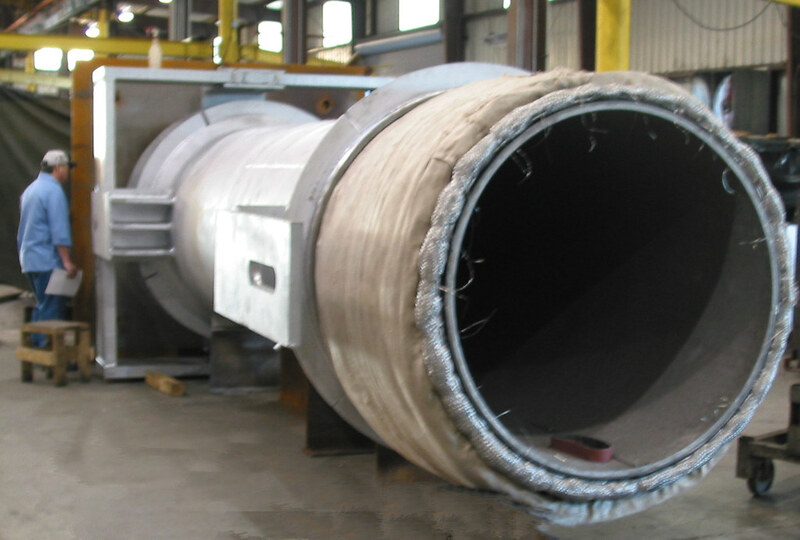 expansion joint will be used for the regenerator stand pipe of the refinery and it is designed for 57 PSIG and 1300°F. Both expansion joints consist of a A516 Gr70 pipe, two SB-443 two-ply bellows and a slotted hinge. To ensure quality, 100% dye-penetration, 100% x-ray and pressure tests were performed on the bellows. 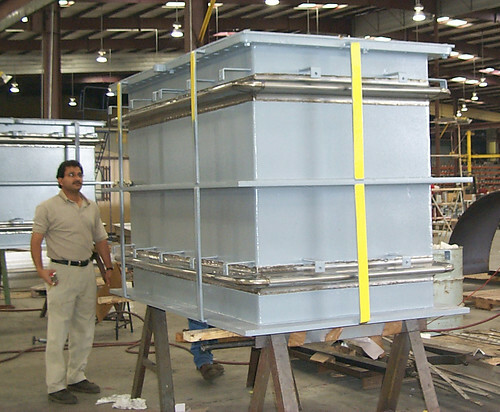 Pneumatic and vacuum tests were also conducted on the expansion joints and between bellows dry plies prior to shipping. U.S. Bellows, Inc. custom designed and manufactured a 55 O.D. 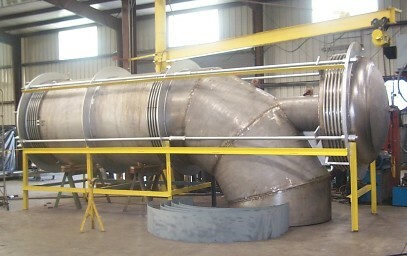 universal gimbal expansion joint with floating rings for the FCC overhead vapor line at the refinery. 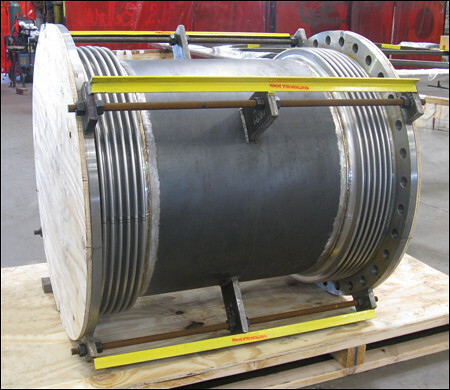 This expansion joint has an overall length of 310 and is fabricated from A387 Gr 11 CI2 spool and Inconel® 625 LCF bellows. It is designed for 50 PSIG and 1075°F with 13 of lateral movement. To ensure quality, 100% dye-penetration, 100% x-ray and pressure tests were performed on the bellows. Pneumatic tests were also conducted on the expansion joint and between bellows dry plies at 55 and 15 PSIG, respectively, prior to shipping. 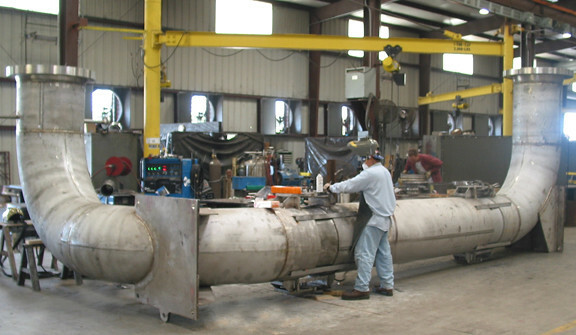 The photograph above shows a 72-inch universal pressure balanced expansion joint designed for a chemical plant in Pasadena, Texas. The expansion joint is designed for 30 psig at 200°F and full vacuum. All materials in the “wetted surface” are TP-316/316L stainless steel. Design movements are 3-inch axial compression and 5 ¾ -inch lateral offset. The assembly is approximately 24-feet long and 14,150 lbs. This picture shows a 47.25″ I.D. Universal Expansion Joint with SB-443 (Inco. 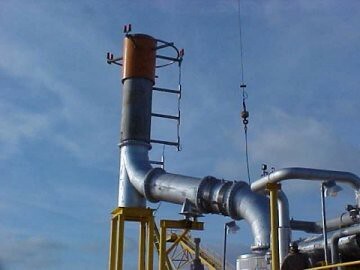 625) round corners bellows, and SA516-70 flanges for ethylene plant in Saudi Arabia. 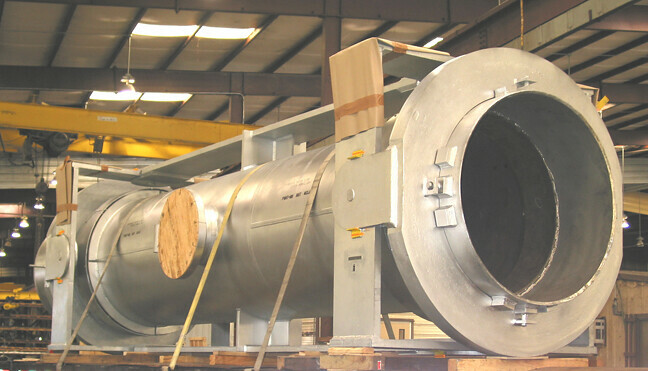 This expansion joint was custom designed and fabricated by U.S Bellows, Inc for an ethylene plant in Saudi Arabia.